BISMARCK, N.D. (AP) -- The developer of the Dakota Access pipeline is gauging shippers' interest in a possible expansion of the volume of crude oil moved through the pipeline from 500,000 barrels to 570,000 barrels per day, despite ongoing tribal efforts to shut the pipeline down. Texas-based Energy Transfer Partners began seeking commitments from shippers to transport additional oil on Friday. 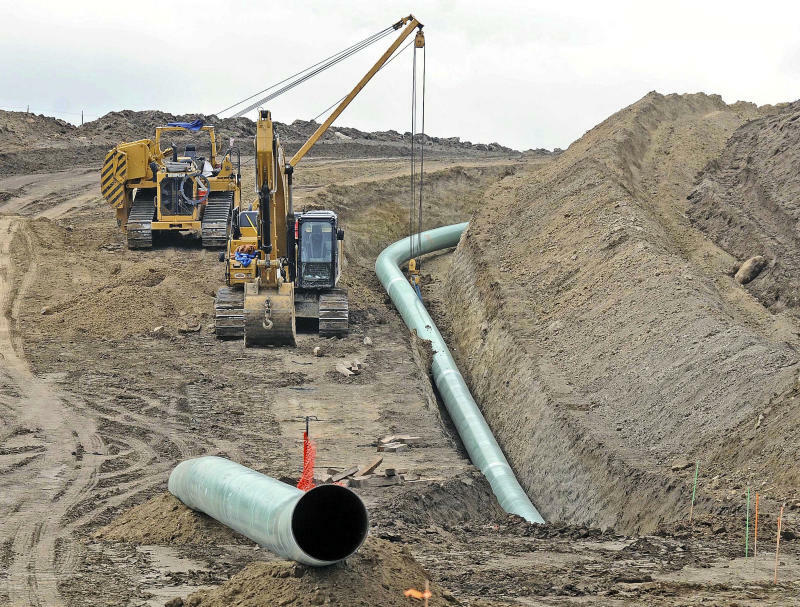 The pipeline's permit in North Dakota allows it to ship up to 600,000 barrels per day. North Dakota produced nearly 1.3 million barrels of oil per day in August, the most recent month for which data is available. Companies can increase pipeline capacity by adding a chemical to make oil flow more easily, or by adding more pumping power or pumping stations, according to North Dakota Pipeline Authority Director Justin Kringstad. Company spokeswoman Vicki Granado told The Bismarck Tribune that an expansion would require minimal modifications to the actual pipeline system. Dakota Access was subject to prolonged protests during its construction in North Dakota in late 2016 and early 2017 because it crosses beneath the Missouri River, just north of the Standing Rock Sioux Reservation. The tribe draws its water from the river and fears pollution. ETP insists the pipeline is safe. That tribe and three others are fighting in federal court to get the pipeline shut down. The pipeline has been moving North Dakota oil through South Dakota and Iowa to a shipping point in Illinois since June 2017. From there it goes to the Gulf Coast through the Energy Transfer Crude Oil Pipeline, which ends at Nederland, Texas. With North Dakota's oil production projected to keep climbing, the state will need to add more pipeline capacity, Kringstad said. "Every expansion at this point is going to assist in keeping the market strong in North Dakota," he said. "But long-term, it will take some substantial new investment to continue to keep North Dakota oil connected to new markets."